...when the sounds of "Sweet Caroline" rocked Fenway Park in the eighth inning last night? Not only was she awake, she was dancing to "her" song! 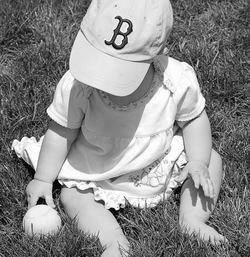 And if you're wondering just how many pictures I have of Karoline in a Boston Red Sox hat, the answer is "more than enough to go all the way!"